Is It Time for the End of 'AIDS'? In late April, New York State governor Andrew Cuomo appeared before a phalanx of cheering HIV advocates to heartily endorse a detailed “blueprint to end AIDS” in the Empire State. In doing so, the governor joined a swelling parade of nonprofit organizations and worldwide governing bodies that, over the past few years, have enthusiastically placed “end-AIDS” rhetoric front and center in their campaigns against the epidemic. Taking this end-AIDS terminology at face value, one might presume that these disease-fighting efforts are centered solely on using antiretrovirals (ARVs) to prevent HIV-positive people from developing AIDS, or to bring their health back from such a state, and from dying from AIDS-related complications. In actuality, groups pursuing end-AIDS strategies, including those behind the New York State blueprint, seek to address more than just sickness and mortality. Efforts typically also focus on preventing HIV transmission, as well as on the overall health, security and well-being of people who will ideally live long, fruitful lives with the virus. The mixed messaging resulting from end-AIDS campaigners’ choice of such narrowly focused verbiage speaks to decades of confusion resulting from the existence of two terms to define the epidemic, HIV and AIDS. 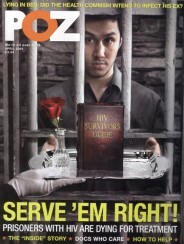 And as the battle against the virus and syndrome alike moves into a new front, the time is ripe to ask whether, at least in certain contexts, the term “AIDS” should be pushed increasingly into the wings so that center stage can instead feature “HIV” and the more broad term “HIV disease,” which has come into vogue among many clinicians and researchers. In the beginning of the epidemic, there was considerable overlap between the diagnoses of HIV and AIDS, both of which were clouded by the despair of that era. (“AIDS” was introduced into the lexicon in 1982. In 1985, an antibody test became available for the virus that causes AIDS, which was discovered in 1983 and named HIV in 1986.) HIV typically meant an inexorable march toward AIDS and death. The beginning of the modern era of highly effective combination ARV cocktails in 1996 drove a rapidly widening gulf between HIV and AIDS, at least in wealthier nations. In the United States, annual AIDS-related deaths plummeted from a peak of 52,670 in 1995 to just under 20,000 in 1998. Today, people with HIV may have normal lifespans, and those diagnosed with AIDS may return to full health thanks to ARVs (although an AIDS diagnosis is still permanent in all cases). Which is not to say that AIDS is no longer a problem—the U.S. death rate has gradually lowered during the past decade, but still stands at approximately 14,000 per year. Nor should we ignore the troublesome fact that 32 percent of Americans who test positive for HIV today also receive an AIDS diagnosis within a year, which indicates they have likely lived many years with an untreated virus. And of course, while an estimated 15 million people are taking ARVs globally, the epidemic is still defined by crisis in many parts of the world. With 35 million people living with HIV worldwide, an estimated 1.5 million died of AIDS-related causes in 2013. Still, over the past two decades, significant worldwide progress in providing access to ARVs has made the difference between the virus and the syndrome highly distinct. By placing “AIDS” as opposed to “HIV” on the marquee of these new, highly ambitious plans to combat the epidemic, those working for a future free of the scourge caused by the syndrome and virus alike are anchoring their messaging in an increasingly outdated and dystopian past. The Joint United Nations Programme on HIV/AIDS (UNAIDS), its own name notwithstanding, issued guidelines in 2011 advising against the use of the term “HIV/AIDS” in particular, and stressed the importance of using the two acronyms distinctly and correctly. (In short, HIV is a virus that causes the syndrome AIDS.) Nevertheless, media organizations as venerable as The New York Times still often use “HIV” and “AIDS” interchangeably. Gregorio Millett, MPH, vice president and director of public policy at amfAR, The Foundation for AIDS Research, prefaces his words on the subject of moving away from the use of the term “AIDS” with the disclaimer that he works for an organization with that acronym in its title. 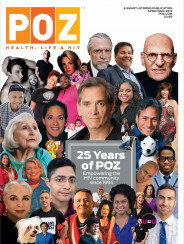 (Indeed, POZ.com’s sister site is called AIDSmeds, a name which is inaccurately restrictive, since one need not have an AIDS diagnosis to benefit from ARVs.) Millett’s acknowledgement underlines the fact that swapping “AIDS” with “HIV” would require a mass, impractical rebranding campaign among countless organizations and governing bodies. As the terror of the epidemic tore its way through the American consciousness in the 1980s and early 1990s, activists during those fraught times endeavored to reclaim the word “AIDS” as their own. In a signature move, they rejected the term “AIDS victims” in favor of “people living with AIDS,” putting the emphasis on survival. Today, there are many long-term survivors in particular for whom AIDS is not just a diagnosis but a badge of honor, signifying their triumph over the syndrome. This personal connection to the term may leave these individuals resistant to changes in the preferred terminology. The Centers for Disease Control and Prevention (CDC) recently introduced a classification system that divides HIV infection into three stages: Those in stage 1 have over 500 CD4 cells; those in stage 2 have 200 to 499 CD4s; and stage 3 is synonymous with AIDS, meaning a CD4 count below 200 or having one or more opportunistic infections. This new method of categorizing the disease’s progression thus allows clinicians and researchers to avoid mentioning “AIDS” entirely if they choose. Anthony S. Fauci, MD, director of the National Institute of Allergy and Infectious Diseases, says he generally favors the umbrella term “HIV disease.” Instead of suggesting a simple binary divide between being HIV-positive and having AIDS, such terminology defines the experience of living with the virus as existing within a larger spectrum of immunosuppression and potential health problems. In late May, results arrived from the long-awaited START trial, which sought to answer definitively the question as to whether it is better to start HIV treatment as soon as possible or to wait until the disease progresses. (Previously, research providing a lower standard of proof than this randomized controlled study had largely found that earlier treatment is preferred.) The study was halted over a year early because it was so clear that earlier treatment was indeed preferable, reducing by 53 percent the risk of serious illness, an AIDS diagnosis or death. Nevertheless, while those who start treatment very early in the course of their infection reap such benefits and may enjoy a normal lifespan, the virus can still damage the body in manifold ways. For starters, within weeks of infection HIV causes enduring harm to the gut that even very early ARV treatment can’t entirely reverse. Also, research has suggested that low-level replication of HIV during treatment and the resulting immune response, including chronic inflammation, may be largely responsible for the elevated rate of age-related conditions among people with HIV. In short, living with HIV in the ARV era increasingly means focusing on quality of life, rather than on averting death. Thanks to the potency, tolerability and simplicity of modern ARVs, fighting AIDS per se is relatively simple and straightforward where treatment is concerned. The real struggle against AIDS lies in the realm of HIV testing and access to care—making people aware of their HIV status and bringing them into and keeping them engaged in the health care system so that they will ultimately adhere to an ARV regimen. When it comes to a variety of social service benefits for which people with HIV may qualify, the law has not necessarily acknowledged the progress made in combatting AIDS, and the fact that the diagnosis is not always dire. In various scenarios, an AIDS diagnosis can be an entrée into housing or disability assistance. Some consider such AIDS-diagnosis benchmarks as unfortunate disincentives for people to keep themselves from developing the syndrome in the first place. As for fighting to end the epidemic, one major HIV organization in particular recently made a public shift in terminology to reflect the evolved face of the epidemic. Whitman-Walker Health, a community health center in Washington, DC, changed the name of its fundraising event, AIDS Walk Washington, to the Walk to End HIV.